Citizen Scientists play a vital role in the research process . Health care and health research are changing. Nationally, scientists, doctors, patients, families, and policymakers want to learn from and listen to one another. Citizen Scientists are members of the community who bring their own life experiences to the research process, engaging with researchers to improve the quality of health care. What Does A Citizen Scientist Do? A Citizen Scientist might, for example, help researchers review recruitment materials, such as flyers, forms and messages; weigh in on the best way to get the word out to the public about research findings; assist with presentations; or participate more extensively as a member of the study team, workgroup or committee. It all depends on the complexity of the assigned project tasks, as illustrated in the chart below. Interested in learning more about becoming a Citizen Scientist? Want to engage Citizen Scientists in your research? Read details about the program below. Contact program staff at OneFloridaOperations@health.ufl.edu. 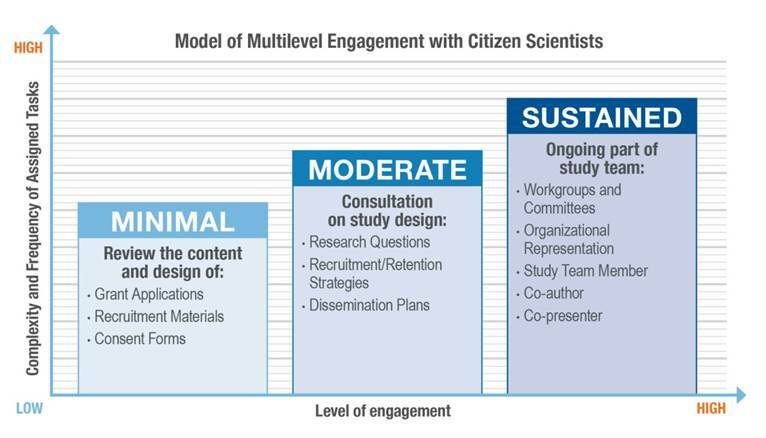 This chart illustrates levels of Citizen Scientist engagement, with examples of tasks associated with each level. These levels are additive; higher levels of engagement include activities from lower levels of engagement. Minimal engagement: Research teams seek input from the Citizen Scientist to inform how research information is communicated. This can mean review of consent forms or recruitment materials to ensure they are easy for patients to understand or something community members would notice. Engaging Citizen Scientists in these activities can affect the success of a research study. For example, well-designed recruitment materials and consent forms that are easy to understand can result in higher participation totals. Citizen Scientists can also offer input on grant applications. Patient stakeholder input is becoming a well-recognized priority for funding agencies. Moderate engagement: A greater level of collaboration and shared decision-making. This may include offering thoughts on effective approaches to get participants involved in the research and how to share the final results with the public. Citizen Scientists can also advise the research team on whether or not the research topic is of interest to the community: an important factor in trying to enroll participants into any study. Sustained engagement: A significant partnership with the research team. This can mean serving as a member of the study team, workgroup, or committee and attending regular team meetings to discuss progress, successes, and challenges of the project. A sustained level of engagement may also include helping with presentations or publications describing the project, or even representing the project team or organization at local, state-wide, or national conferences or meetings. This final level of engagement involves a significant time and effort investment on the part of the Citizen Scientist. Citizen Scientists receive training in clinical research topics through the Citizen Scientist Curriculum, which offers levels of certification that align with the levels of engagement. Once Citizen Scientists complete this training, they may engage in research at any level. The University of Florida has a long tradition of engaging and working with patients and their families. The initial work focused primarily on ensuring that the perspectives of parents who had children with special health care needs, as well as those of the children and adolescents themselves, were incorporated into research. As early as 1998, parents were included as co-investigators in children’s health studies. The UF CTSI Citizen Scientist Program expands on this approach and engages community members who may or may not have specific health conditions.The Implementation Science Program at the CTSI began with Innovation Studios — roundtable discussions of research proposals that included a variety of stakeholders. Although the discussions were mutually beneficial, patients needed additional background to feel comfortable speaking during these meetings, and researchers needed additional training in meaningful stakeholder engagement. The Implementation Science Program recruited individuals to become “patient scientists.” As training materials for both researchers and participants were developed, the patient scientists renamed the program, and what ultimately became the Citizen Scientist Program was born. The program was further developed to engage patients and community members as meaningful collaborators throughout the research process, and is a diverse group that varies by gender, age, race, ethnicity and cultural representation. The vision for this program is to help create a learning health care system. A learning health care system looks to clinical practice — real-world doctors’ offices, patients, and their families — to find out what questions are important to ask. Citizen Scientists, researchers and health care systems are partnering to come up with creative and practical solutions that impact patients and families. That way, answers are more relevant to the real-world settings in which people seek health care every day. The University of Florida and UF Health approach to the learning health care system is patient-centered, which means it listens to the voices of patients, families, and the general public. Patient-centered research can improve the quality and relevance of research. The Citizen Scientist Program prepares members to be a part of the conversation about health research. Ultimately, high-quality and practical research will change how patients interact with their doctors and will have a positive effect on their overall health. Several funding agencies explicitly support this shift toward inclusion of end-user perspectives in the research process. The Patient-Centered Outcomes Research Institute (PCORI) and the Agency for Healthcare Research and Quality (AHRQ) are especially interested in engaging diverse stakeholders in the research process. Members of UF CTSI Citizen Scientist Program meet regularly, and researchers are always welcome to present to the group in order to get feedback on research questions, logo or content creation, research materials, and other items. If a greater level of engagement is requested, researchers may come present their work along with the specific ask for a volunteer or two to serve on the study oversight group or be part of the research team. Before attending a Citizen Scientist Program meeting to discuss your research, you will need to submit background on the project to the Program Manager for dissemination to the group. This information must be in lay terms, and any abbreviations or complex concepts must be clearly explained (see checklists and resources below). Providing this background information prior to the meeting allows time for the Citizen Scientists to gain a basic understanding of your work prior to discussing specific needs your team may have. Biosketch: a short biographical sketch – but not NIH-formatted. This should be in lay language. Project Overview: a short summary of your proposed project. Again, this should be in lay language and should include information about the research question, methods, outcomes, and what you hope to accomplish by conducting this research. Please see these examples. Be sure to define any acronyms or terms. If you are unsure whether something is in lay terms, give it the “small-talk test”: If a stranger asking what you do for a living would not understand, it should be defined in greater detail. typically are not in lay language, they may still be a helpful resource. Materials in lay language or short, concise materials are ideal. Meeting Goals: a list or description of what you hope to accomplish by meeting with Citizen Scientists. This can include a meeting agenda or list of questions. Always thank the Citizen Scientists at the end of the meeting. It is nice to follow up with an email or note. Provide the Citizen Scientists with information on how their feedback was incorporated into the study design. The Citizen Scientists want to know their contribution to science was valuable. This can be done either with the Citizen Scientists directly or through the Citizen Scientist Program Manager. This feedback should be provided within two weeks of the meeting. It is crucial that you inform the Citizen Scientists whether the study was funded, met recruitment goals, or any other feedback on the outcomes of your collaboration. This is one of the most frequent requests made by Citizen Scientists: they very much want to know about the ultimate funding decisions and subsequent updates on how the research is progressing. The Citizen Scientist Program Manager may follow up with you periodically to request this information. The Citizen Scientists understand that it may take months or years to know the final outcome. If in the course of meeting with Citizen Scientists for project development you meet a particular individual that you would like to invite to be a member of your study team, you should notify the Program Manager. You will be asked to provide a rough idea of monthly time commitment and to provide information as to role and travel expectations. Keep in mind that compensation for this time commitment will come from your research study funds.